Our breads are all naturally leavened, made entirely with organic wheat and specialty grains. 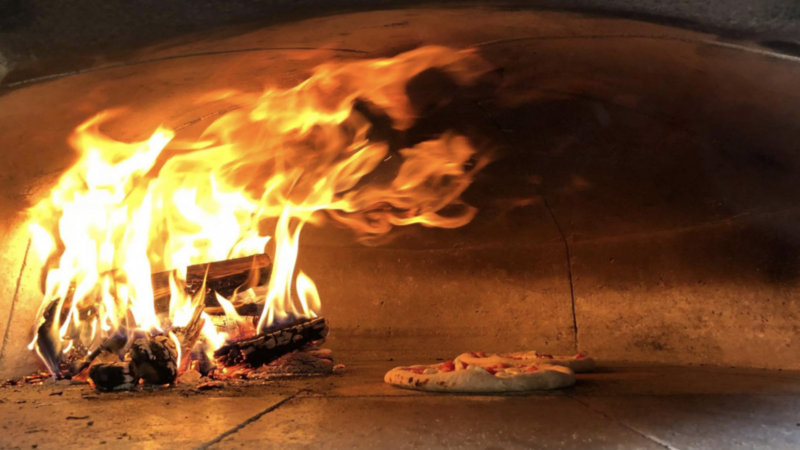 Locally sourced as much as possible, they are carefully hand-crafted and hearth-baked in our wood oven, which by nature limits the amount we can bake, keeping quality high. All our breads contain 10-60% fresh milled flour, which is milled daily to keep the nutritious germ oil and unique aromas of the grain intact. Using a natural sourdough starter in our breads maintains the tradition of long fermentation to improve flavor and quality. 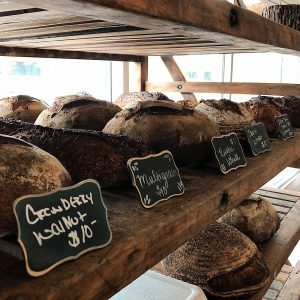 Each loaf from start to finish is a 36-hour process. 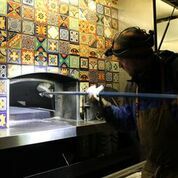 We bake in a wood fire oven that is used daily for our wood fire pizzaria. This process utilizes the full heat cycle of the oven and little to no energy is wasted. Our light sourdough studded with unsulphered dried apricots and roasted pecans. Slightly sweet. Our light sourdough with chunked asiago and red pepper flakes. Our light sourdough, studded with bright green castelvetrano olives, lemon zest, and Herbs de Providence. Our sourdough take on the traditional Italian “slipper bread”. Thin crust, moist interior, makes great sandwiches. Our light sourdough with whole fresh cranberries and toasted walnuts. Featured on our Sunday Brunch menu as our house French toast. Our natural rye starter was created over 20 years ago by Jeffrey Hamelman. Whole grain fresh milled rye is used. Inside interior spotted with caraway seed. Fresh milled organic emmer flour. Emmer is an ancient grain, and was first domesticated in the B.C. era. Emmer is now grown rarely and we can only find it in North Dakota. Our light sourdough with fresh jalapenos and sharp cheddar. Makes the BEST BLT sandwich! Said to be the wheat of the Pharaohs, found in an Egypt tomb. Fresh milled organic Khorasan wheat. Khorasan is an ancient grain originating from the Fertile Crescent, more specifically the historical province of Khorasan. It has a rich nutty flavor. This is a cross between Red Fife and Hard Red Calcutta, developed in Canada in the early 20's. This particular wheat was grown in Chugwater, Wyoming. We use 45% fresh milled Marquis Wheat in this bread. Whole wheat sourdough with generous additions of flax seed and sunflower seeds. Porridge breads are a great way of adding additional flavor and nutrition to bread. We like to use organic rolled oats, slightly fermented with our sourdough starter. A light sour whole grain wheat bread. 20% fresh milled. Leavened with our natural wild starter, lightly sour, this bread is great for sandwiches or just butter. 10% fresh milled wheat. This whole wheat bread takes on a smoky flavor from the toasted sesame seeds and smoked gruyere cheese. Our take on the classic French baguette, crisp exterior, soft cream interior. Fresh milled organic Spelt wheat. Spelt is another ancient grain, dating back to biblical times. Slightly sweet ad nutty in flavor. Our light sourdough with sundried tomatoes and parmesan. Great for Italian night! Our take on the famous German bread. Fresh milled Spelt, rye flour and pumpernickel flour with heavy additions of sunflower seeds and pumpkin seeds. Slightly sour with a buttermilk tang, slightly sweet with honey. Fresh baked breads available Wednesday to Sunday. Rustic White, Rustic Wheat, Multigrain, Baguette, and Marquis Wheat available regularly.